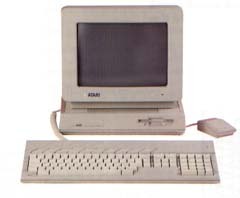 Before making snide comments, remember this was 1985 and the rest of the world was mono green monitors, 5.25" floppy, and 512k-640k, 8 bit bus, DOS 2.x, and 300 baud. * Integrated GUI operating system. * Motorola MC68000 16/32-bit processor running at a blazing 8MHz. * RAM memory storage of 256k, 512k, or 1Mb (depending on model). * Integrated video controller capable of generating (320x200x16), (640x200x4), and (640x400x2) video modes from as many as 512 colors. * Yamaha 3-voice FM sound generator. * Sophisticated DMA peripheral access. * External 128k cartridge port. * Built-in MIDI, two joystick ports, 720k floppy drive, ACSI, serial, and parallel ports. All for less than a thousand dollars!!!!! * Seperate keyboard and CPU. * BLiTTER chip (for faster graphics). * Peripheral co-processor slot (for MC68881 math co-processor, etc.). * Internal expansion bus. * Either two or four megabytes of RAM. I run some of my Atari software now on my Mac with MagicMac, but I still use the STs for music, and they haven't missed a beat. Really rock steady when it comes to timing, which is good. For a COMPLEAT (almost too complete!) description of the Atari line, go see this page.